I am a nerd. This is a fact I have long since embraced. So it's no suprise I often find myself drawn to nerdy art. What might surprise people, though, is that I love it even without understanding. Complicated equations well outside my field, intricate diagrams, interlocking mechanisms. The attention to detail gets me everytime. Thus it is that despite my lackluckluster chemistry skills (let's just say I once finished a final in just one hour because I ran out of questions I could comprehend) I fell madly and deeply in love with molecularmuse. Gorgeous, simple, graceful, chemical structures? Check. Sterling silver exquisitely crafted? Check. The only hard part is deciding what molecule represents you. Are you dopamine (a pleasure chemical found in the brain), caffeine (the old standby), estrogen (a modern, brainy, feminist), or something else entirely? And, just in case you prefer to claim your chemicals in another form the shop also offers glassware. The first image below shows the caffeine pendant, which first caught my eye. You can see the delicate craft involved when you look at the join between pendant and chain. Molecularmuse has carefully created a small loop in the end of the metal for the chain to pass through. From a normal viewing distance, you would never even notice the join, just a single creation. The way the pendant and chain join so seamlessly together recalls the way that molecules combine together to create one visible whole. The second image showcases a bit of nerd humor--a wine decanter branded with a representation of ethanol. 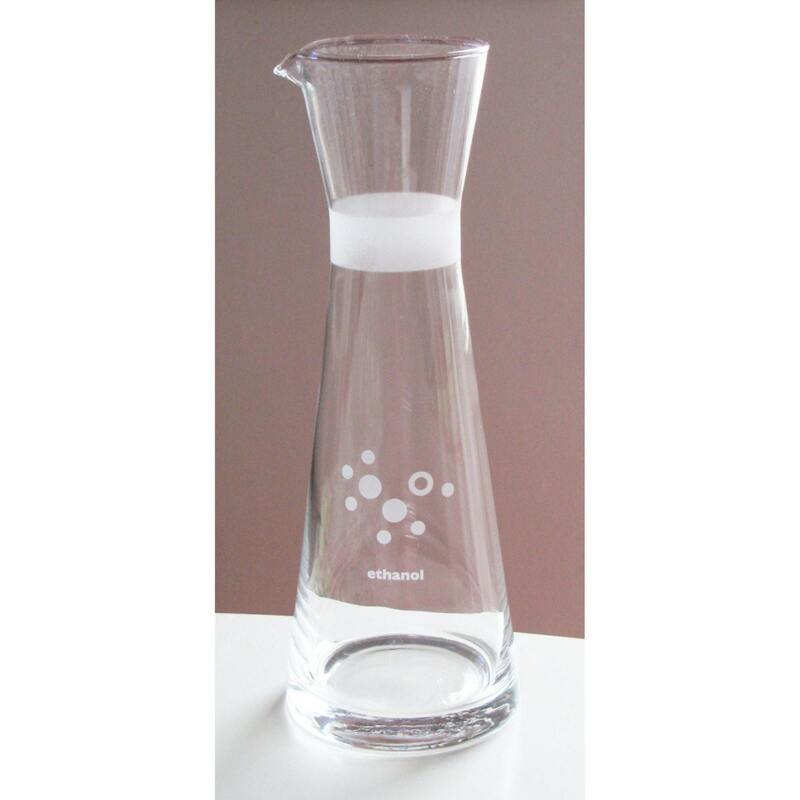 The shape of the decanter recalls lab beakers (although I bet this one is in MUCH better shape than the grungy, smelly, abused beakers we dealt with in chem lab)--even the sandblasted design brings to mind the study measurements etched on their sides. If you know sciency, classy people, this store is a must shop to visit for housewarming gifts, birthday gifts, and the all to quickly approaching holidays! And if you are one of those sciency, classy people, what are you waiting for? What a wonderful showcase. I have a tee that has the caffeine molecule on it, but it is becoming quite worn. I will investigate that beautiful necklace as a replacement. I hear ya, MrsDragon. 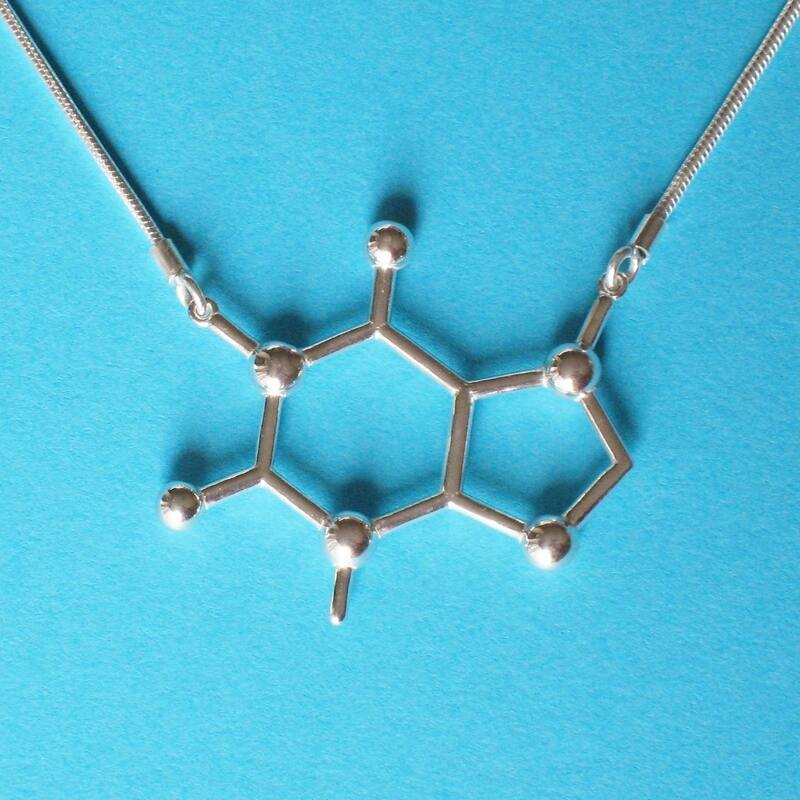 I've loved molecularmuse since my first glimpse at that caffeine necklace. Brilliant stuff over there and fantastic spotlight on them.